The Red Wolves Foundation is based on a priority point system that helps fairly allocate donor benefits such as premium seating, chairback seating location, bowl game and other post-season ticket benefits. Donors receive points primarily based upon the consecutive number of years they have given to the Red Wolves Foundation, as well as the total cumulative contributions they have made. This rewards a donor’s longevity and gift amount when establishing priorities. 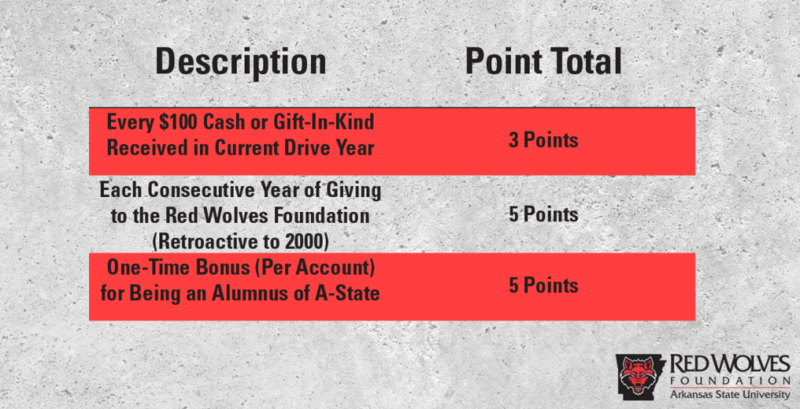 With the point total, the Red Wolves Foundation can rank all donors within each giving category.